The Countess Alyssa Swarovski necklace features a sparkling pear drop crystal bead surrounded by a hand-woven silver wire wreath and crowned with 5 smaller crystal bicone beads on 2 tiny silver flower heads. 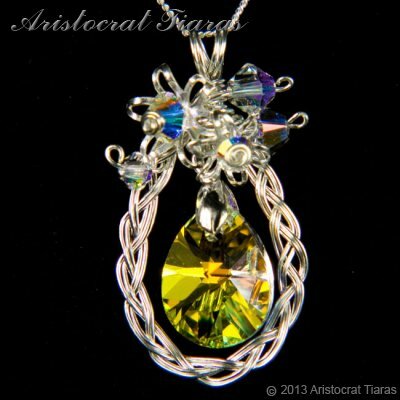 This stunning handmade necklace from Aristocrat Tiaras is part of our bridal jewellery collection for brides designed to compliment our bridal tiaras such as Princess Sohpie tiara. All our Swarovski jewellery is handmade in Herefordshire UK suitable for weddings, balls, proms, parties and many other functions! Colour and designs may vary slightly from the picture.